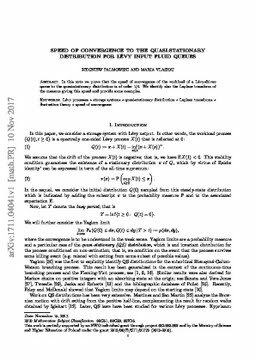 In this note we prove that the speed of convergence of the workload of a Lévy-driven queue to the quasi-stationary distribution is of order 1/t. We identify also the Laplace transform of the measure giving this speed and provide some examples. Palmowski, Z, & Vlasiou, M. (2017). Speed of convergence to the quasi-stationary distribution for Lévy input fluid queues.